BEWG (Beijing Enterprises Water Group Limited) is a leading provider of professional, wide-ranging water environment services, including urban water services, watershed water services, industrial water services, seawater desalination, environment sanitation and solid waste, clean energy and technological services. Actively exploring opportunities to establish a whole environmental protection industry chain, BEWG focuses on the utilisation of clean energy. Tweet This! This case study is based on the 2016 Sustainability Report by BEWG published on the Global Reporting Initiative Sustainability Disclosure Database that can be found at this link. Through all case studies we aim to demonstrate what CSR/ ESG/ sustainability reporting done responsibly means. Essentially, it means: a) identifying a company’s most important impacts on the environment, economy and society, and b) measuring, managing and changing. 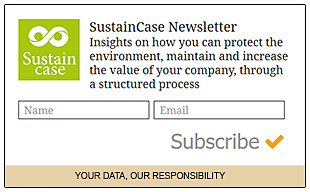 Please subscribe to the SustainCase Newsletter to keep up to date with the latest sustainability news and gain access to over 100 case studies. These case studies demonstrate how companies are dealing responsibly with their most important impacts, building trust with their stakeholders (Identify > Measure > Manage > Change). What are the material issues the company has identified? In its 2016 Sustainability Report BEWG identified a range of material issues, such as business compliance, environmental protection awareness raising, product and service quality, offering environmentally friendly products and services, occupational health and safety. Among these, utilising clean energy stands out as a key material issue for BEWG. Stakeholders must be consulted in the process of identifying a company’s most important impacts and their reasonable expectations and interests must be taken into account. This is an important cornerstone for CSR / sustainability reporting done responsibly. To identify and prioritise material topics BEWG conducted a stakeholder survey through an online survey platform, and received 377 pieces of stakeholder feedback from 19 provinces. 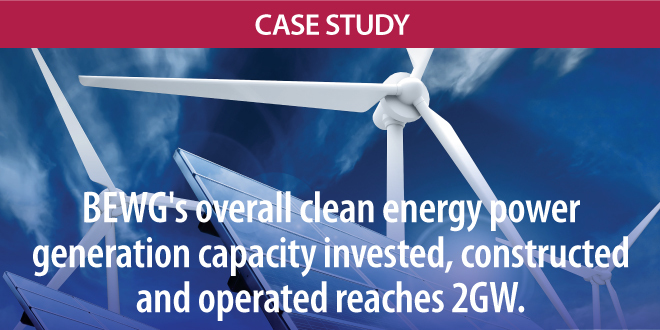 What actions were taken by BEWG to utilise clean energy? In Hebi City, Henan Province, BEWG built a 100MWp photovoltaic power plant on the barren hills near the Baisi village in Miaokou Township. BEWG’s goal, is to exploit the place’s potential in rich solar energy. A key solar energy project for the province, the power plant not only made good use of the barren hills, but also created jobs and contributed to the development of the local economy. In addition, BEWG built a photovoltaic power plant on top of the wastewater treatment pool of the Jiacheng wastewater treatment plant in Shenzhou, Hebei Province. The photovoltaic power plant did not affect the normal operation of the plant and achieved both economic and environmental benefits, by utilising the electricity generated at the site. The project is expected to generate 341,000 kwh of electricity, equivalent to annual savings of 106.7 tons of standard coal – significantly reducing BEWG’s energy consumption. In Binzhou City, Shandong Province, BEWG operates the Lusa 48MW wind power generation project. The project was officially launched in May 2016 and, since 31 December 2016, the Lusa 48MW wind power generation project has generated 35,397,000 kwh of electricity. on top of the fish farm, BEWG achieved the combined production of electricity and fish, optimising space use and saving land resources. The photovoltaic power generation units are adjustable, to create the ideal environment for fish in the water beneath and increase the fish farm’s yield. As a consequence, the complete and full- dimensional development of photovoltaic power generation and fish farming is achieved. The project’s actual power generation exceeded the designed capacity, because of the exceptionally good quality of its construction and the outstanding performance of its equipment. It is estimated to be able to generate 70,000,000 kwh of electricity per year. Which GRI Standards and corresponding Sustainable Development Goals (SDGs) have been addressed? Note to BEWG: With each case study we send out an email requesting a comment on this case study. If you have not received such an email please contact us.